We are so blessed to serve in such a thriving and giving community! 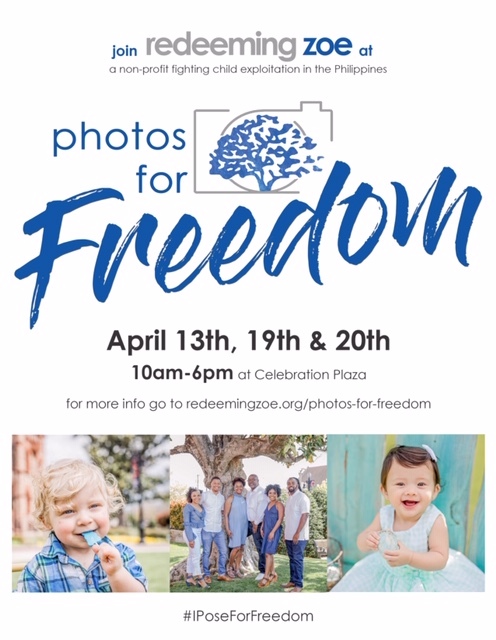 We are excited about this year’s fourth annual event called Photos For Freedom. For the past three years during the Easter holiday, Redeeming Zoe has offered mini Easter photo shoots and all proceeds have gone to fighting child exploitation in the Philippines. Unicef recently did a study and shared that 8 out of every 10 children in the Philippines are at-risk and being exploited online through O.S.E.C. (Online Sexual Exploitation of Children). 77% of all victims are perpetrated by their parents. Redeeming Zoe means to “repair life”. We want families to “pose for freedom” this year! April 13, 19 & 20 2019 10:00 am until 6:00 pm.